This blog contains our news, world-wide pagan news and guest bloggers! We are so excited about our up coming Spiral Scouts meeting on Oct 30th. If you are interested, please let us know. Our on-line classes are slowly being finished and the first should be up by Samhain. If you have any ideas of classes you would like to see or if you want to teach an on-line class, get with me. Still hoping we can re-plan our big Bonfire that got rained out in August and start up our Pagan Field Trips and movie nights again. With the veil thining, has anyone had any experiences they would like to share? Be a guest blogger! So here we are for another moon journal entry. Last night I could not sleep well AT ALL. It was just awful. This morning when I woke up for work I was soooo tired and had a headache, so I called into work and said that I would be late. I went back to sleep with an ice pack and took some excedrin. 2 hours and a whole bunch of crazy weird dreams later, I felt AMAZING!!! Even though work sucked, I still had a happy day. Lunar forecast for today: This day is connected with the use of prayers, mantras, verbal magic, and work with spirits and elements of nature. Day when prayers have the magic power of faith. Everything we say and wish to ourselves and others, has potential to become reality. Recommendations: Today nature surrounding us is very receptive to what we say, even unintentionally, and we have to work with our verbal skills. Sincere prayers and good wishes will come true. Day is great for practicing yogic asanas (physical exercise), and doing work with our hands. 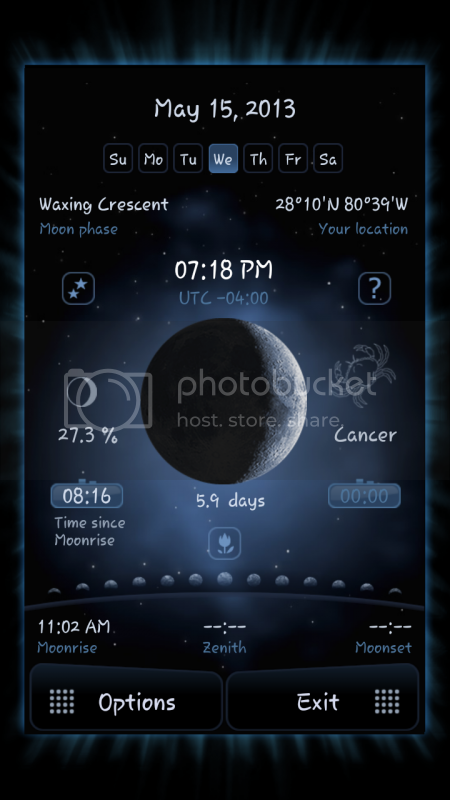 And I forgot to post this last time, but in case any of you have an Android device and would like this app. (Which is great, I love it.) This is the app I use. Thursday, the day of the new moon was a very weird day. Everyone I know was in a weird mood and all my co-workers were acting very odd. It was all in a good way though! We were all laughing and joking and just having a good time. It seemed like people were more open to the community type idea of socializing. It was a nice change of tide for my work environment. Usually everyone is plotting against each other and crabby and working to piss each other off. Today is Saturday, I have felt irritable, but happy and grateful all day. I had a headache and just lazed around for the first 2/3 of the day. lol. 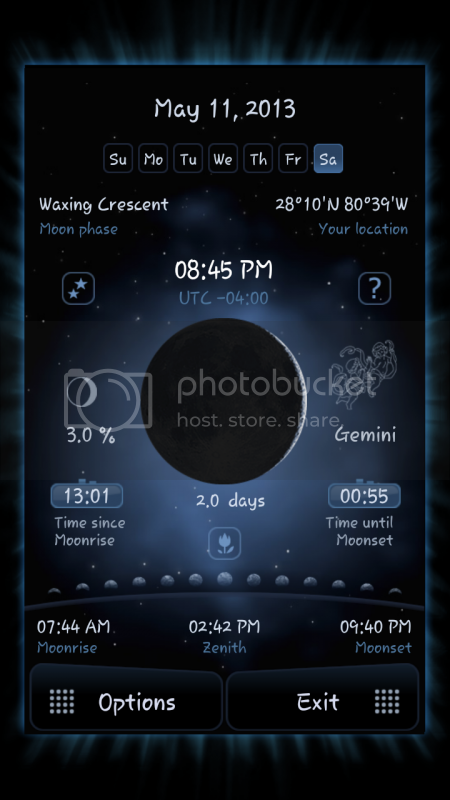 Lunar Details: The moon is in Gemini and a waxing crescent. Good for planting above-ground crops with outside seeds, flowering annuals. Time for asparagus, cabbage, celery, endive, and spinach! A good time to sowing, transplanting, budding, and grafting. Lunar Forecast: Day of aggresion and active struggle, fight for beliefs and interests. Day of beginning of realization of plans, when nothing can stop us, and we have enough energy to overcome any obstacle. Recommendations: It is necessary to concentrate and use astral energy for self-defense, and work with all bio-energies. Physical activity, big intesive training routine is recommended. Best day for practicing martial arts. Sauna or bath is recommended. I hope you enjoy this little entry!